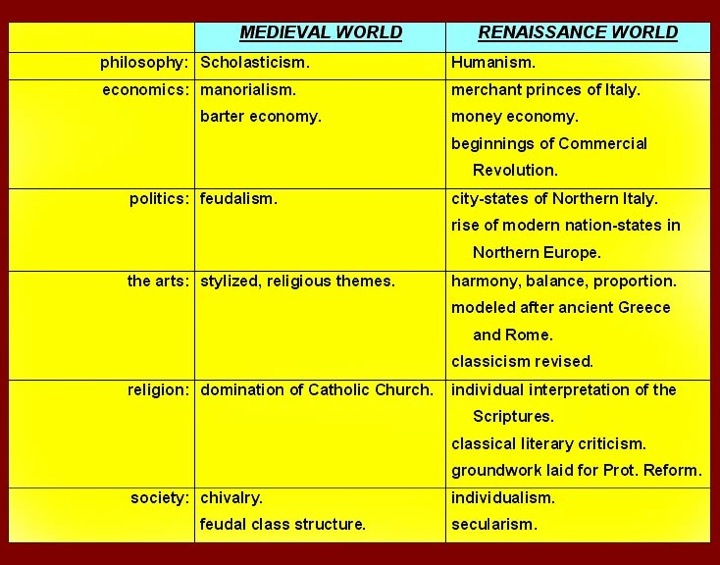 The Renaissance was a complete change from the period immediately before it, but it had marked affinities with the classical period of which it claimed to be a rebirth. The start of the artistic renaissance is usually said to have occurred in Florence and its dependencies, but the intellectual renaissance was firmly centered in Rome and in the papal curial bureaucracy which first revived the Latin classics (particularly Senecan stoicism) and later revived the Greek philosophical classics (especially after the movement from Constantinople to Rome of Basilios Bessarion.) For information on Bessarion and his influence on the Roman renaissance, see http://en.wikipedia.org/wiki/Basilios_Bessarion. 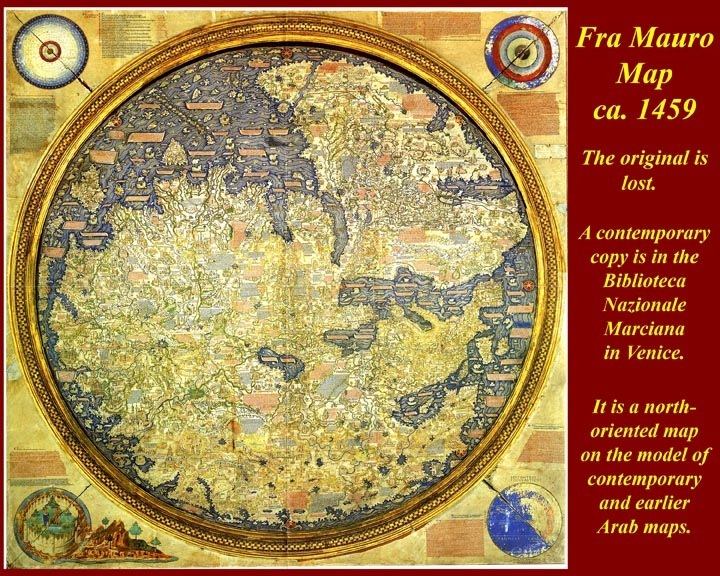 The map drawn by Fra Mauro in 1449 reflected the accumulated knowledge of Europe and the Middle East about the world. 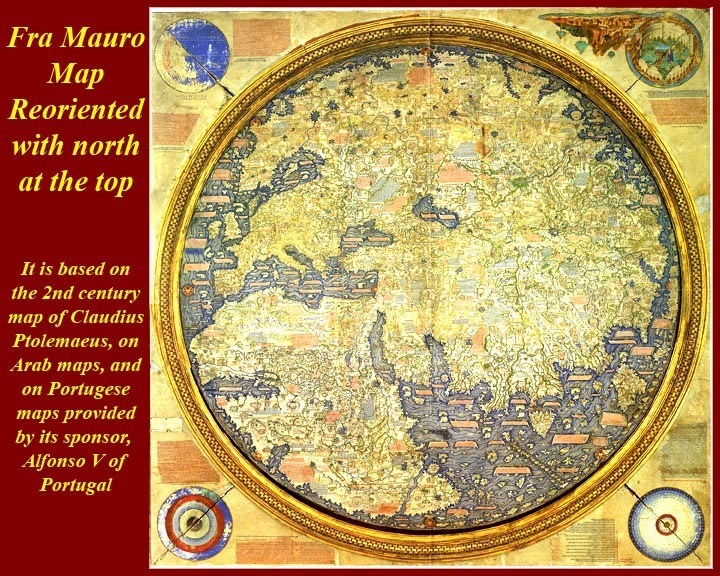 The map was commissioned by Alfonso V of Portugal, but the copy that was sent to him is lost. 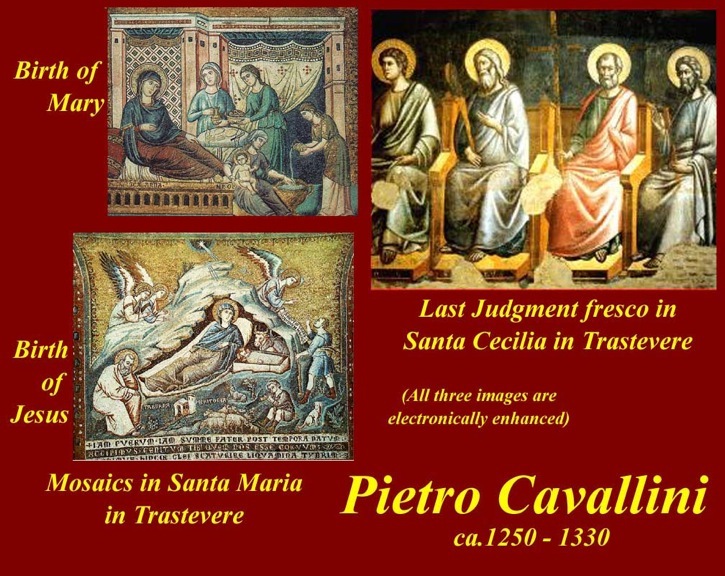 Fra Mauro was making a second copy when he died, and it was completed by his students. 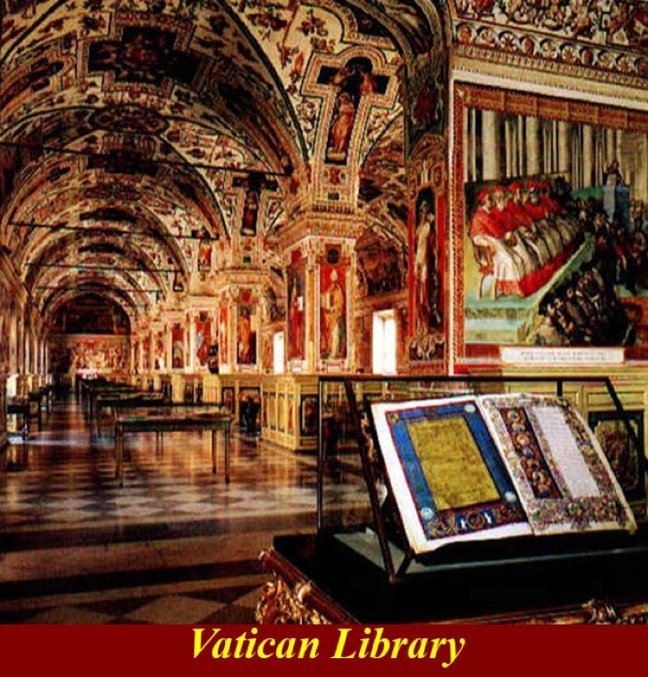 That copy, found in his monastery on Murano Island and now displayed in the Biblioteca Nazionale Marciana in Venice, is shown here. It is based on the 2nd century AD Ptolemy map, which was circulating in Europe in Latin translation since 1406, on Arab maps and on Portuguese exploration maps and Journals supplied by Alfonso. 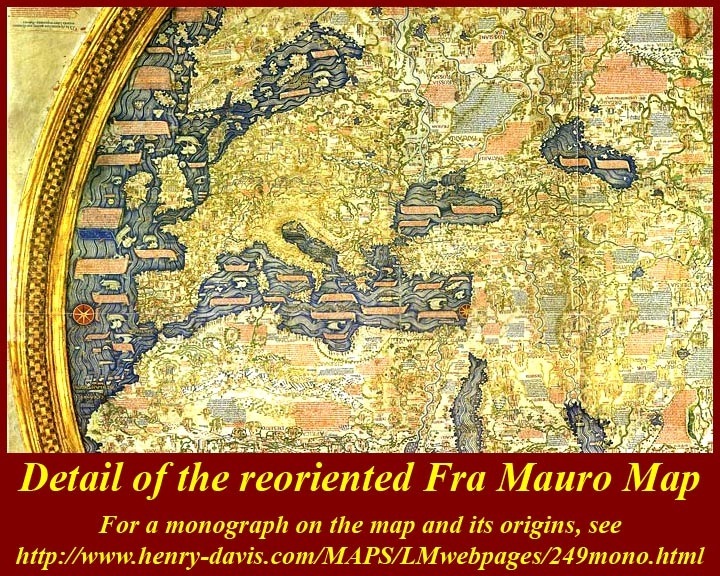 Although in many ways it is more accurate than the Ptolemy map, the Fra Mauro map was not widely circulated -- the less accurate Ptolemy became the standard when it was widely circulated twenty years after the Fra Mauro map was completed. 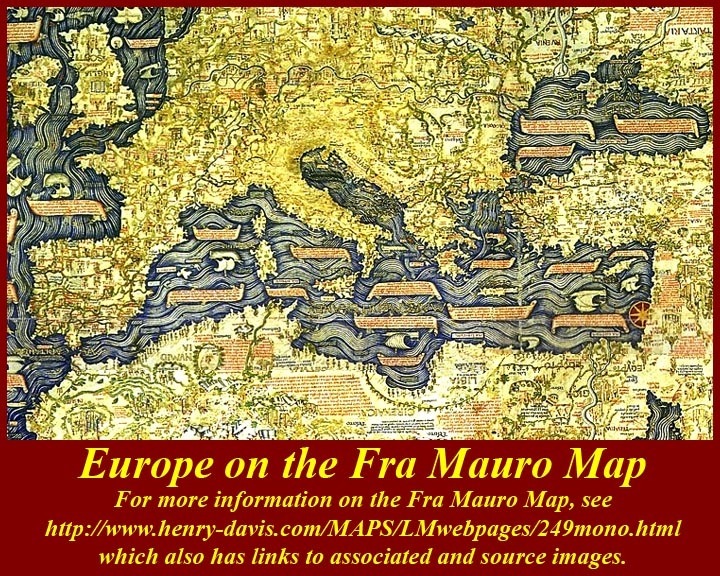 A monograph about the Fra Mauro map, with links to images, is at http://www.henry-davis.com/MAPS/LMwebpages/249mono.html. 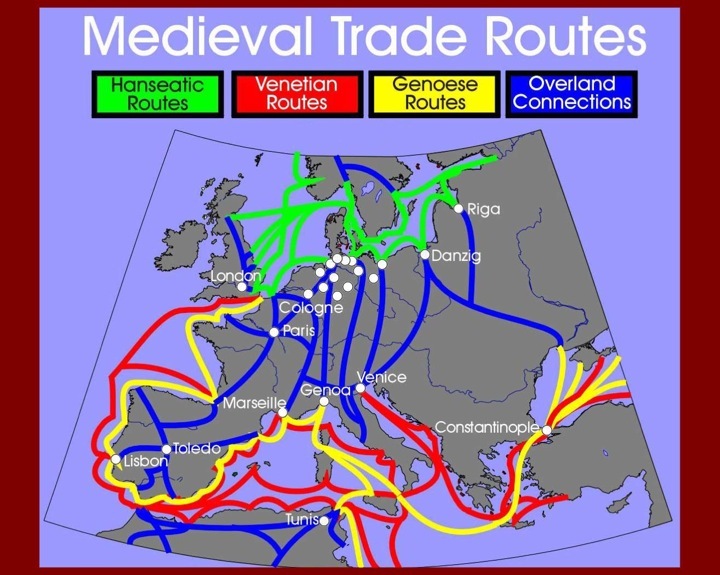 Medieval Trade Routes already connected the major centers of European commerce at the start of the Renaissance. The centers of commerce were also the centers of knowledge, and many had universities and learned monasteries. The curricula of medieval universities were based on Benedictine scholasticism, and any change was vigorously opposed. Only after the Black Death emptied out the universities (1347-50) did the new humanistic scholars have a chance to flourish. 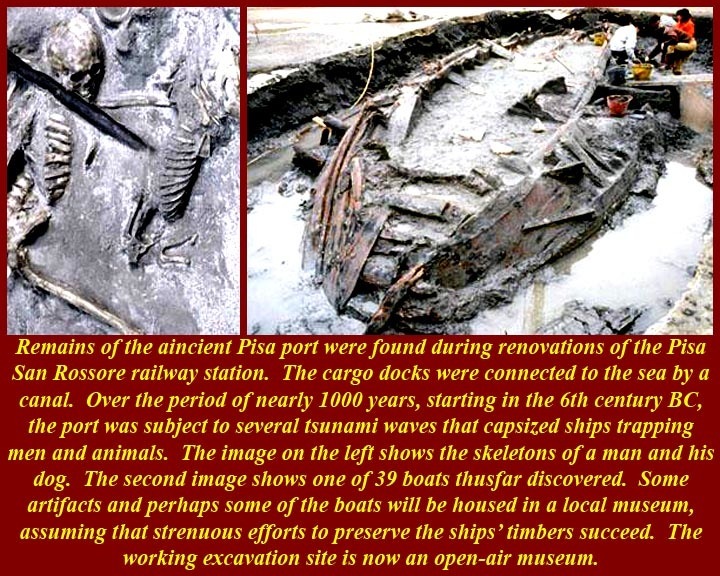 The ancient Pisa trading port has been found during construction of the Pisa San Rossore railway station. Numerous ships, which apparently were capsized during periodic tsunami occurrences have been excavated. 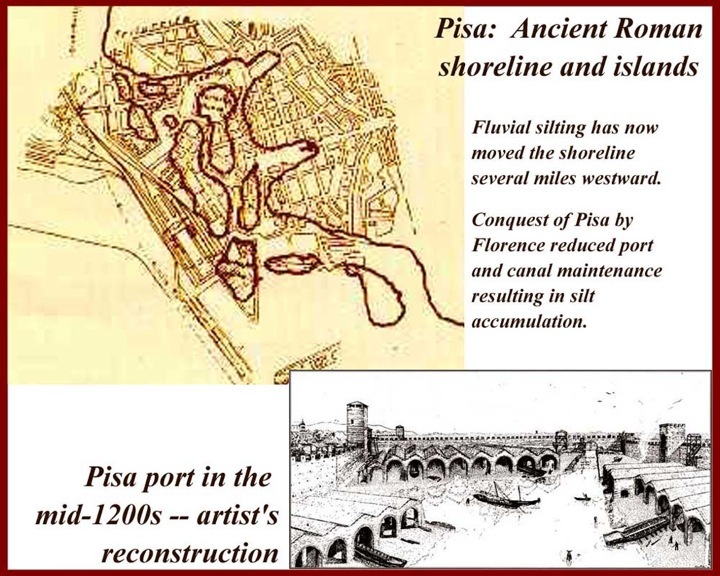 The Pisa port was one of several ports that connected Italy to the rest of Europe during the medieval period. 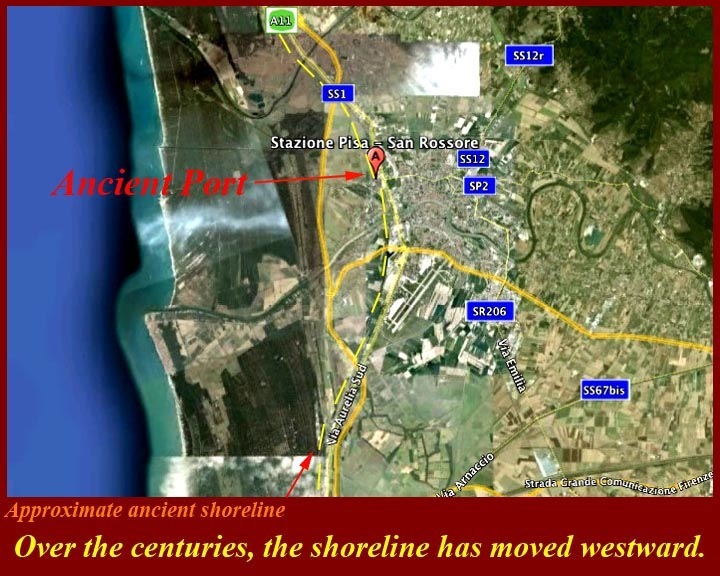 It is also, supposedly, the port through which the plague passed on its way to northern European ports in 1348. Medieval Banking was was the all-important grease for the wheels of commerce. The Medici family originally may have had some connection with medicine (doctoring? or pharmacy? The little red balls on their coat of arms are said to be pills -- see http://en.wikipedia.org/wiki/File:Coat_of_Arms_of_Medici.svg). But they soon got into the banking trade. Members of the Medici family entered the Florentine banking business in the latter 1300s. In 1393 Giovanni di Bicci de’ Medici (1360–1429) took ownership of the Roman branch of a bank owned by one of his Florentine cousins. He moved the headquarters of this bank to Florence in 1397, the official founding date for the Medici Bank. At the time Rome was a source of funds, whereas Florence offered a better market for making loans. A notable contribution to the profession of accounting was the improvement of the general ledger system through the development of double-entry bookkeeping for tracking credits and debits. This system was first used by accountants working for the Medici family in Florence. Street Markets occupied the piazze in front of large medieval churches. 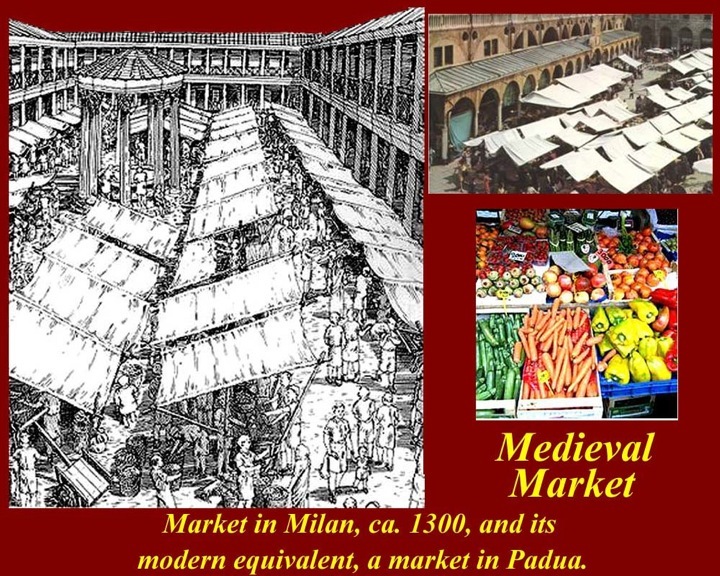 The same kind of markets occupy the same spaces today. 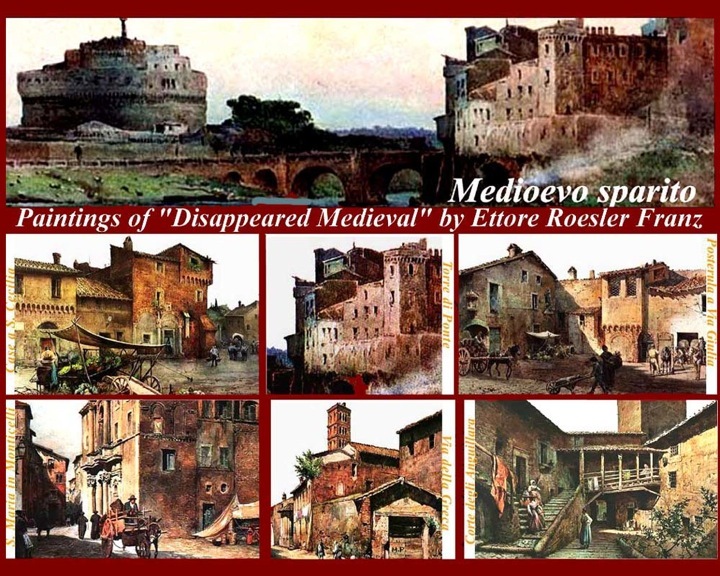 Medieval Rome Disappearing -- Medioevo Sparita. Ettore Roesler Franz, a 19th century Roman painter produced a series of 120 aquerelles named "Roma sparita" (disappeared Rome), where he portrayed with great realism parts of the city which he supposed were going to be destroyed in the effort to modernize it. 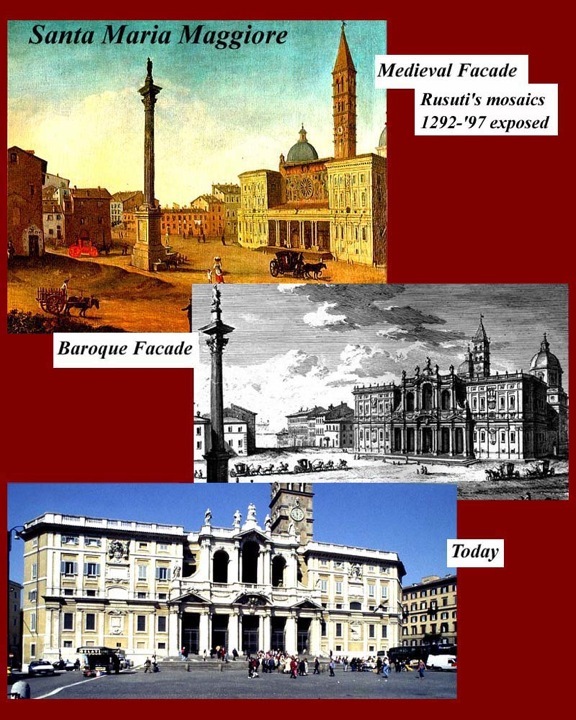 These paintings are now at the Museo di Roma in Palazzo Braschi (at the southwest corner of Piazza Navona facing Corso Vittorio Emanuele II). 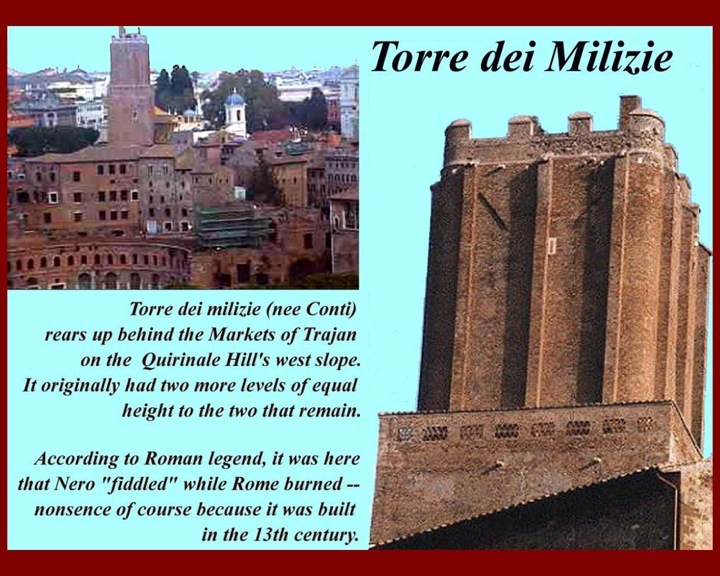 Some towns stood on fortified hilltops like the medieval core of Corinaldo. The successor to the isolated Ancient Roman rural villa was the fortified Medieval manor house. 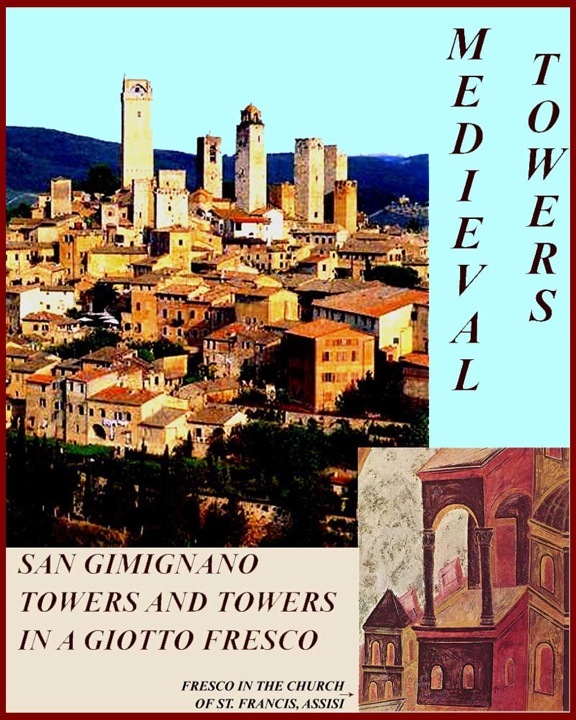 "Manorialism" with serfs tied to the land virtually disappeared with the arrival of the high death tolls associated with the plagues that swept through Italy after 1347. 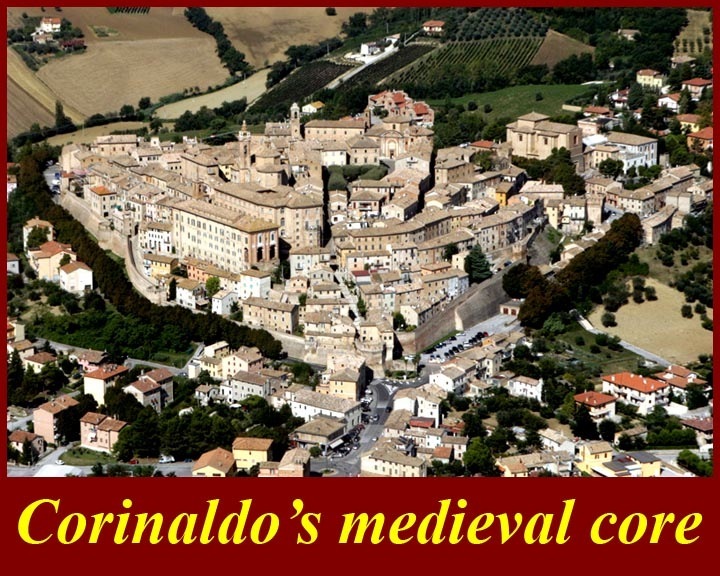 Manorialism required solidarity among the "signore", the rich owners of the land. 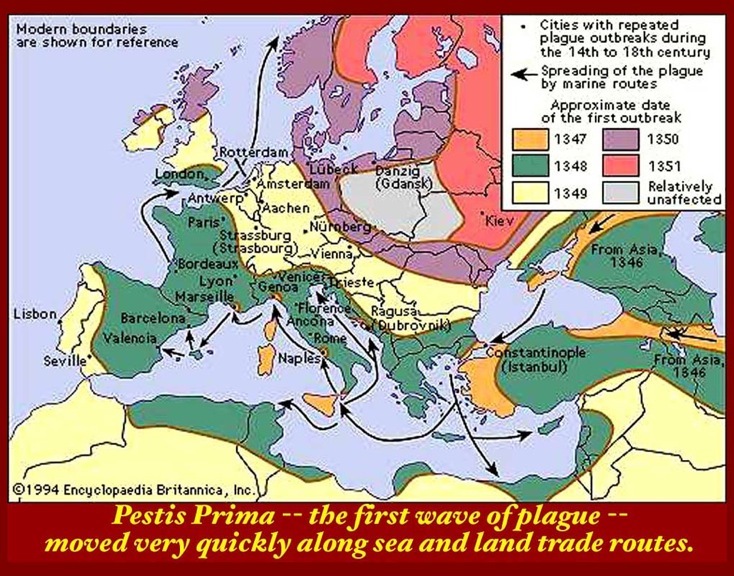 When urban populations were wiped out by plague, many serfs ran off to cities to replace them leaving fewer of them to work the land. 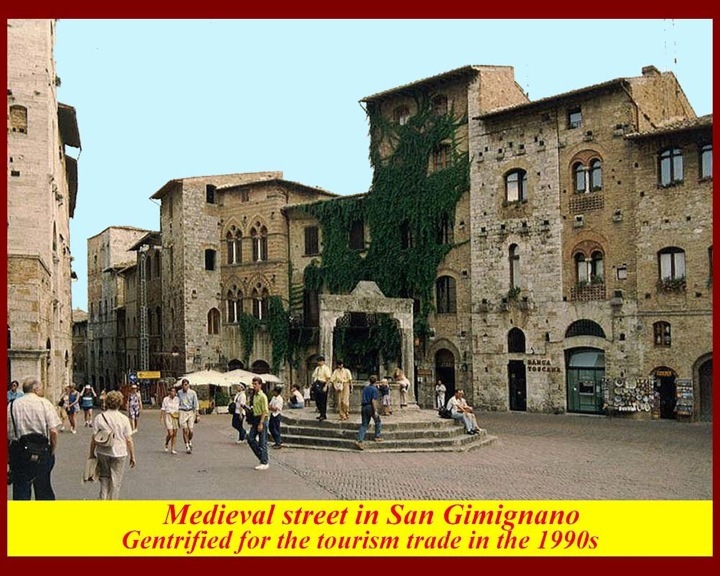 The "signore" then started to actively poach their neighbors' serfs, and soon a rural wage-labor market developed. Signorial solidarity was irretrievably broken. 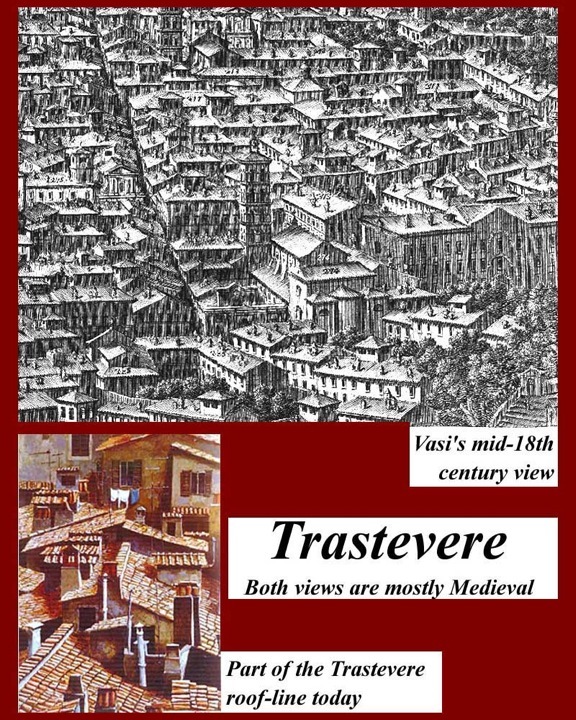 Medieval Trastevere. Trastevere (= trans-Tiber, across the river from the "historical center" of Rome) was always a place where outsiders dwelled. It was outside of the ancient city's pomerium or sacred boundaries -- a place for non-citizens and for those who didn't worship Rome's gods. It was the place, for example, where ancient Rome's Jews and Christians and Mithraists and Isis worshipers (like Cleopatra) could be expected to reside. It was also a place where an emperor or his wife might have a river-side hideaway. 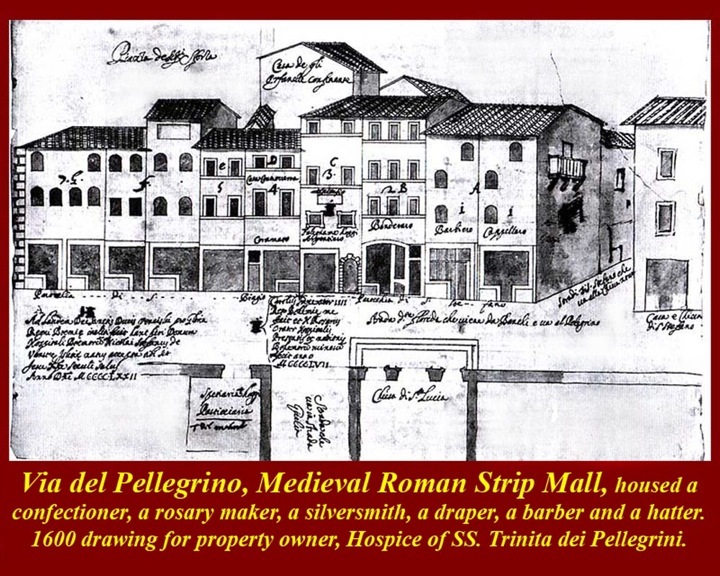 The district became crowded in Medieval times, and most of it escaped urban renewal during the renaissance -- except, of course, those riverside imperial hideaways which were replaced by renaissance hideaways. 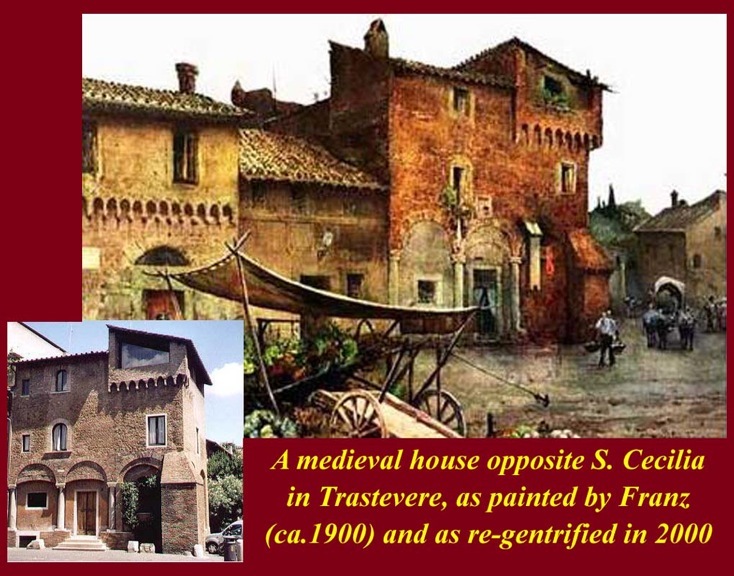 Medieval Trastevere is still there today, although many of its buildings are being renovated as high-priced condominiums like the houses opposite the church of Santa Cecilia shown in the fourth image above. Medieval Houses in the Republican Forum. 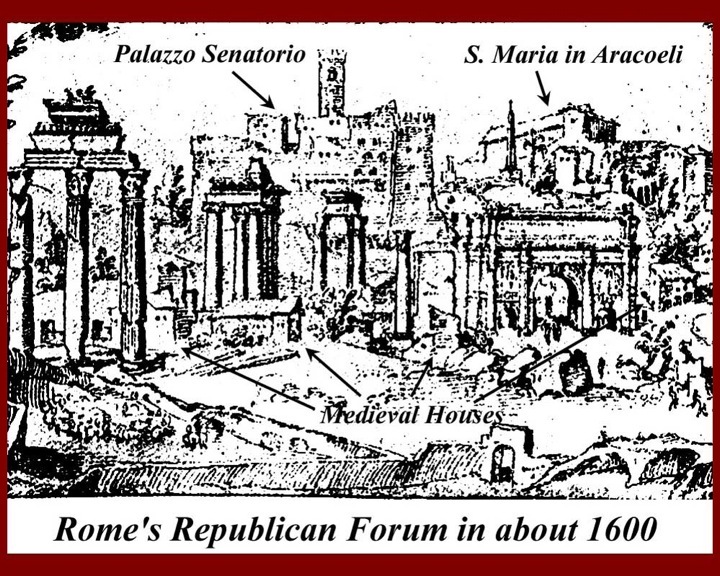 The Roman republican forum became a pestilential quagmire after the eastern Roman emperors stole the metal clamps that held together the cloaca maxima, the sewer that had drained the area since the times of the Etruscan kings that had ruled Rome even before it became a republic. 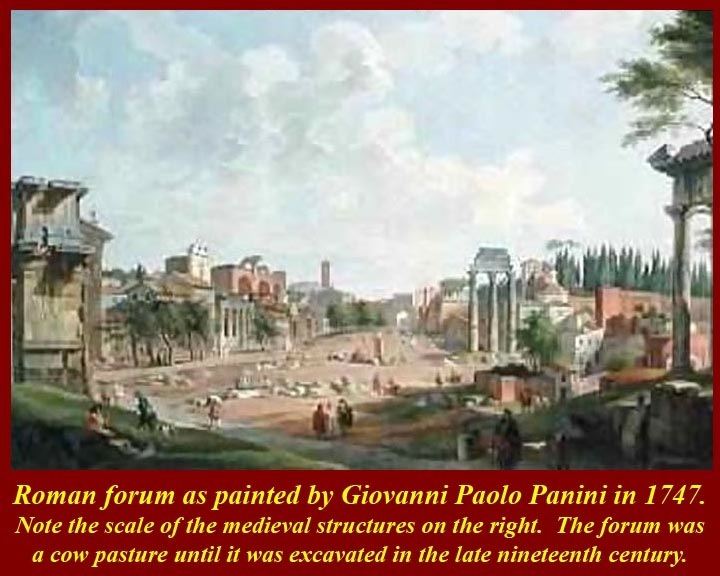 By the time of the renaissance the streams leading down from Rome's hills had silted up the forum to the point that it could be used as a campo vaccino or cow pasture. 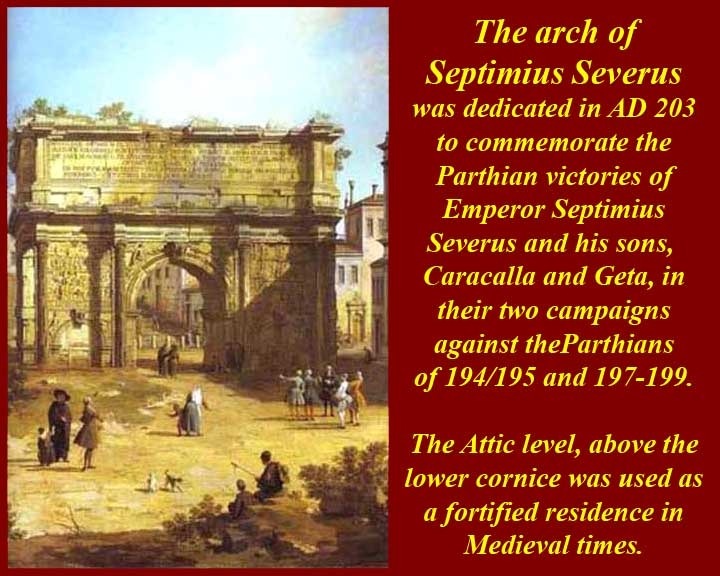 A few medieval structures were built along one edge, and the Arch of Septimius Severus, only the top half of which was exposed, became a fortified home of a local capo. The forum escaped the attentions of renaissance builders except for several churches build around its fringes and except for its use as a mine for ancient Roman marble -- the base of the ancient bronze statue of Marcus Aurelius that Michelangelo put up in the center of Piazza Campidoglio was once part of the steps leading up to the temple of Castor and Pollux. The forum, in fact, wasn't really excavated until the 19th century. 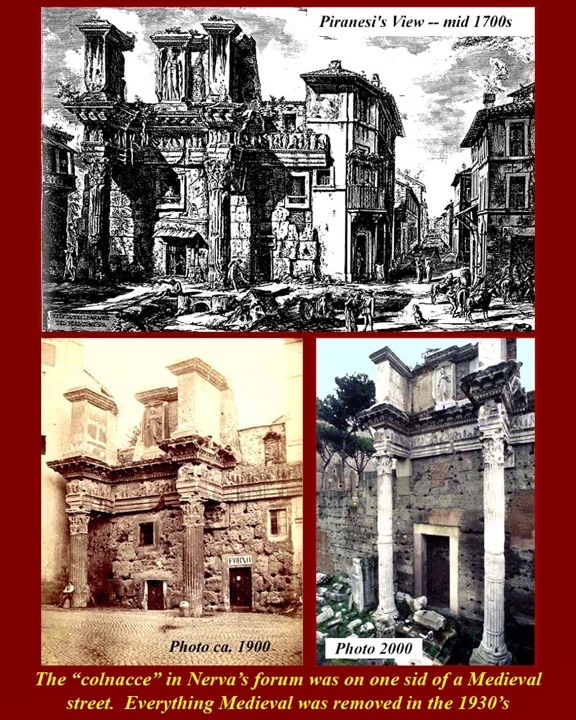 Carlo Fea began his work around the Severus arch in 1803, and, later in the century, Rudolfo Lanciani formed a core of distinguished late nineteenth-century scholars of the Roman forum including Henri Jordan, Christian Huelsen, Samuel Ball Platner, and Thomas Ashby. Excavations in the republican forum continued into the 20th century, and in the adjacent imperial forums excavations are still under way. 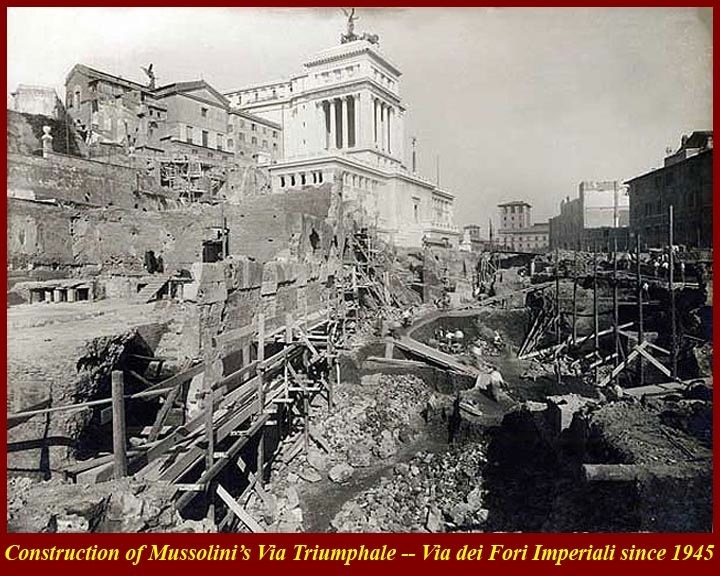 Constructed between 1931 and 1933, the Via dei Fori Imperiali (originally Mussolini's Via Triumphale) was one of the most controversial of all the urban reconstructions carried out at the time. 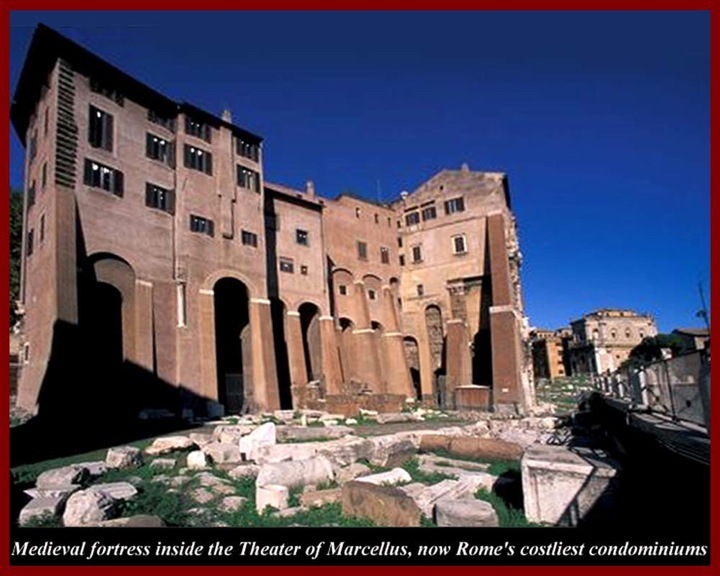 The opening of this road wiped out one of the most extraordinary zones of the city where various strata of Renaissance and medieval buildings lay above the ruins of the ancient forums. 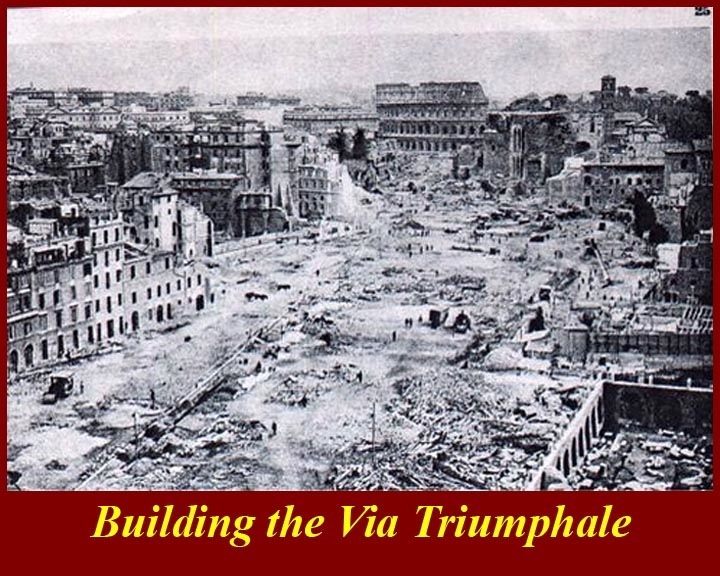 In creating this street that links the Colosseum with Piazza Venezia, the loss of monuments and churches was not given any weight. 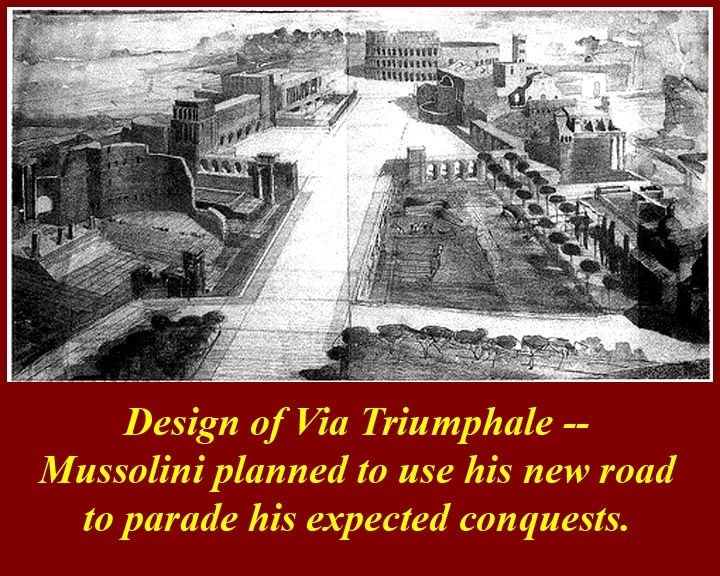 At the same time, the road ruined a plan, going back to 1800, to create a great archeological park embracing the area of the forums, the Circus Maximus and Via Appia Antica. 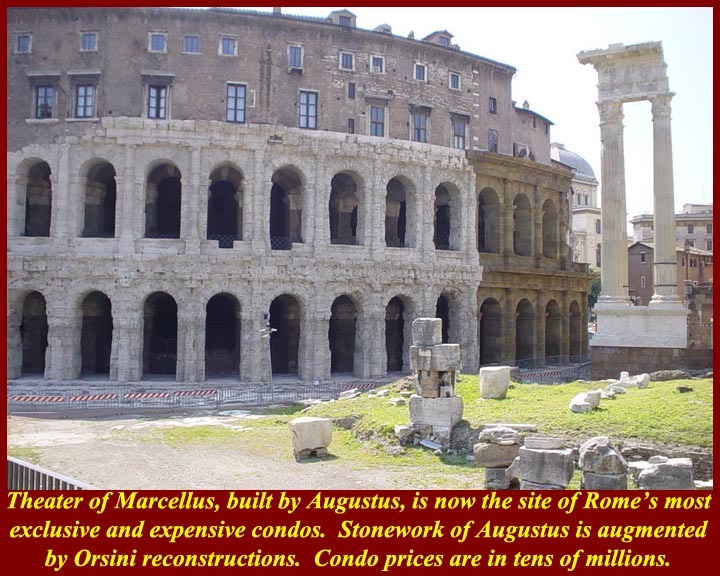 The excavations of recent years on both sides of the Via dei Fori Imperiali have uncovered many ruins but many monuments remain buried under the street. 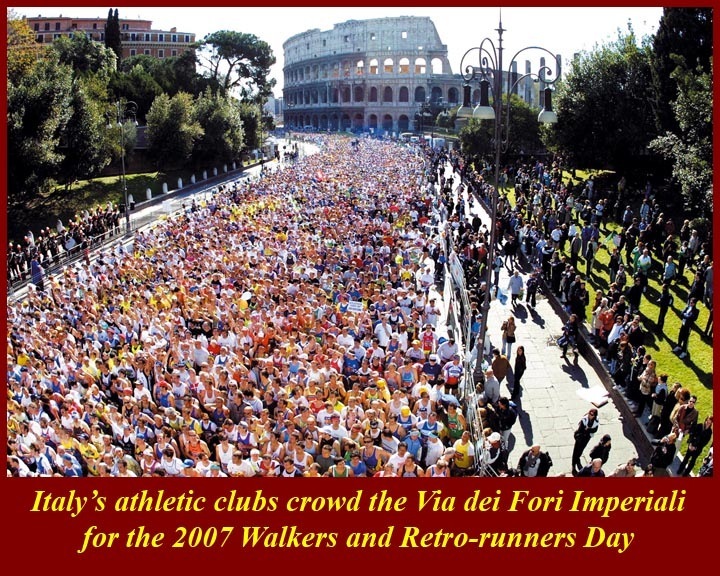 The city council of Rome decided in 1980 to remove the road in order to complete the excavations of the imperial forums, but, in the Italian fashion, that work has not yet been started. 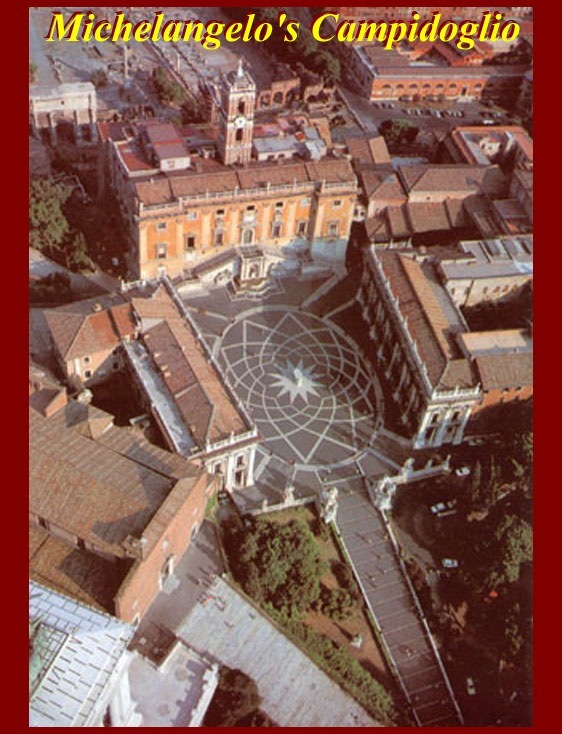 Rome's Capitoline hill, Campidoglio in Italian, is an architectural palimpsest. 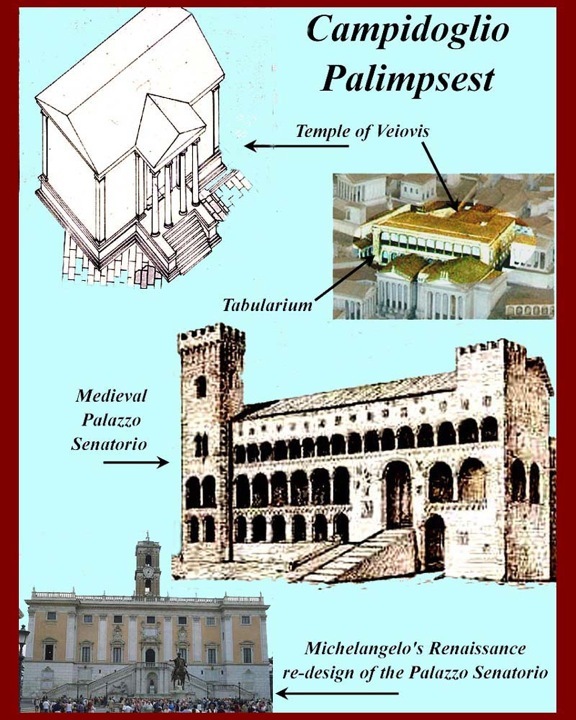 A pre-Roman temple of Veiovis is overlaid with the ancient Roman Tabularium (archives) and with a medieval fortress-house which was remodeled by Michelangelo. Michelangelo's building at the back of his Piazza Campidoglio (with the bell tower) now houses the ceremonial rooms of Rome's municipal government. His other two buildings on the Piazza house the Capitoline Museums. The layers under the municipal building are accessible to visitors. Entry is through the museums. Dante Allighieri, Francesco Petrarch, and Giovanni, three giants of Italian Renaissance literature. 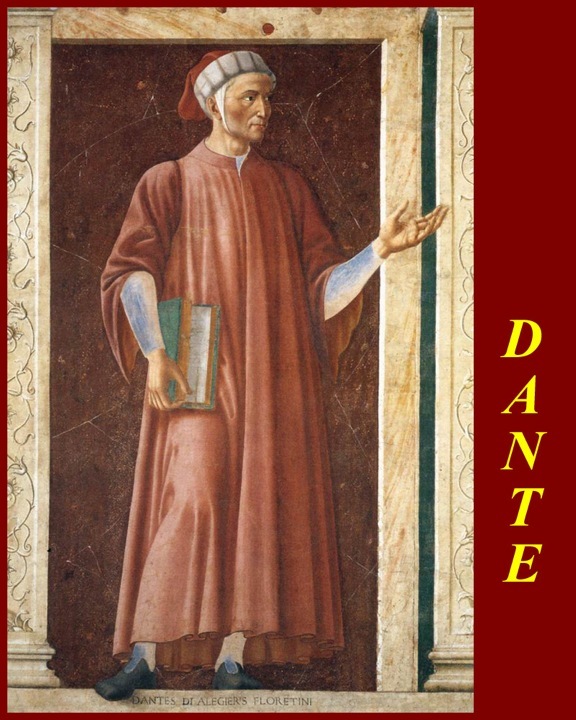 They were initially castigated by humanist Latinists for their Italian vernacular writings, which the Latinists claimed had degraded classical Ciceronian Latin, but they are now celebrated as the fathers of the modern Italian language. 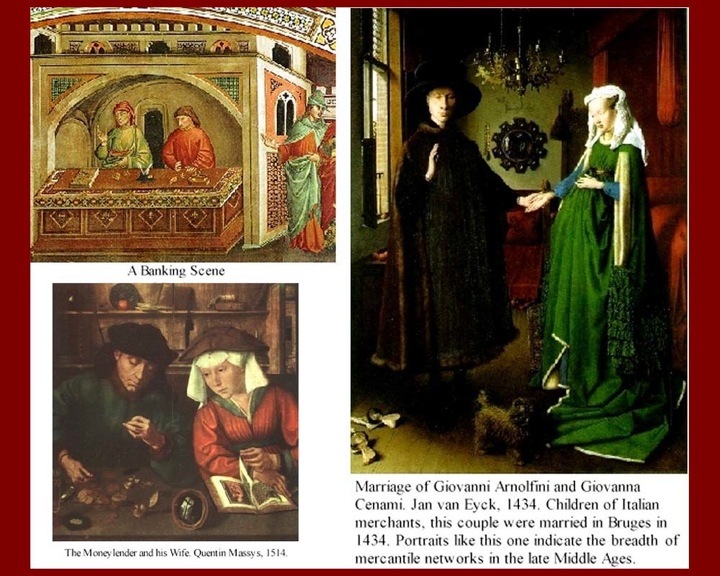 All three images are frescoes from the nine part Il ciclo degli uomini e donne illustri (= cycle of famous men and women) painted by Andrea del Castagno (Andrea di Bartolo di Bargilla, ca. 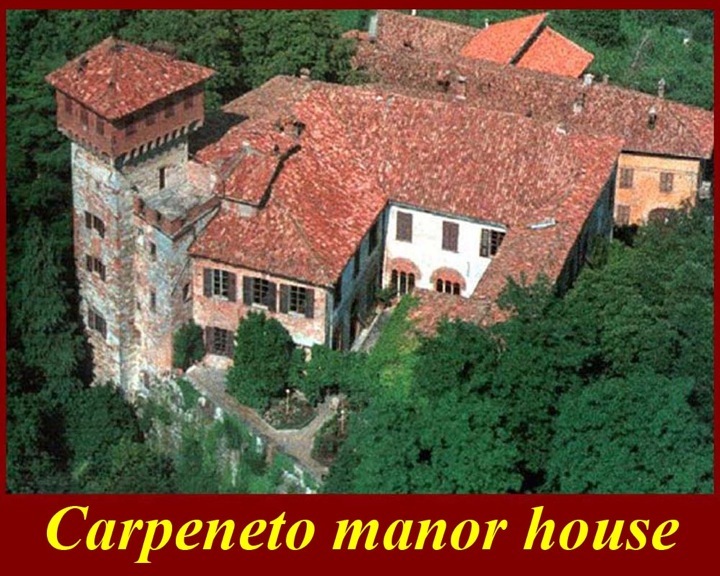 1421/23 - 1457) around 1455 for the Villa Carducci di Legnaia or Villa Carducci-Pandolfini, Florence, Italy. The frescoes are now in the Uffizi Museum in Florence (but not on public display) and replicas are in the Villa. 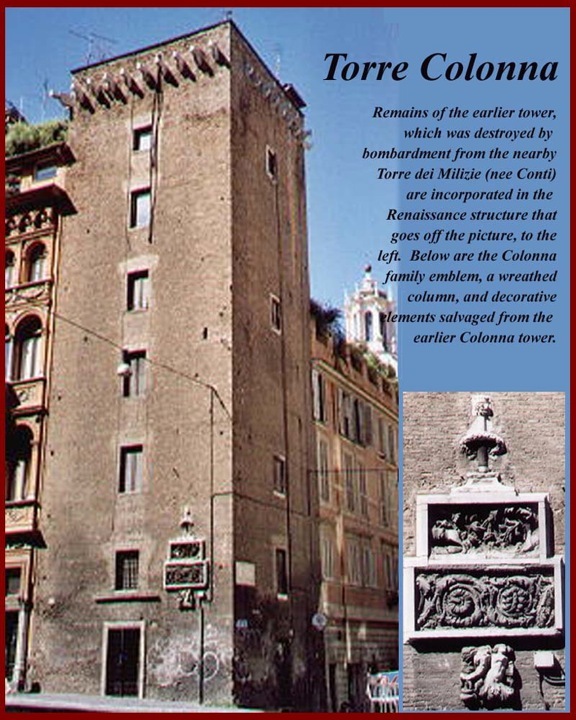 The frescoes were of the three Tuscan Poets, three condottieri and three "famous women" (Queen Esther, Queen Tomyris and the Cumaean Sibyl), and all nine can be seen on the Internet at http://www.paradoxplace.com/Perspectives/Italian%20Images/Montages/Art/Andrea%20del%20Castagno.htm. Châteauneuf du Pape in Avignon, where Petrarch imbibed French Romance, heard the poetry of the 11th to 13th century Provencal Occitan troubadour poets and got the idea for the invention of the sonnet. 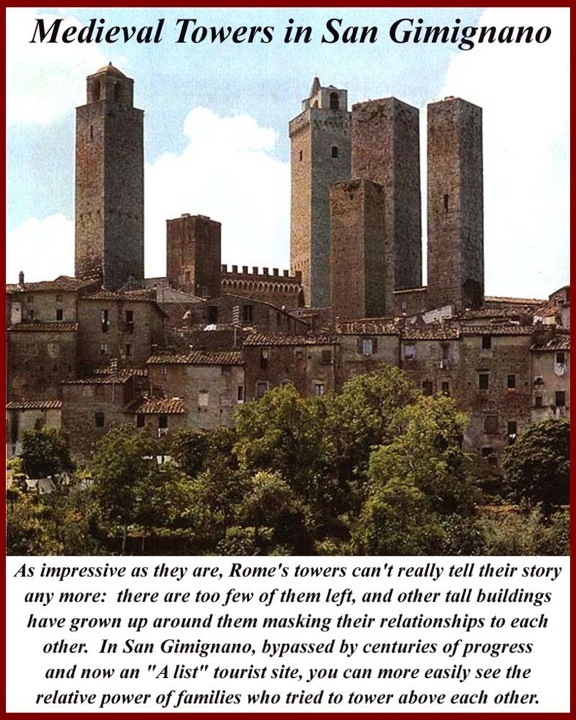 Petrarch was also an éminence grise behind Cola di Rienzi and was in and out of favor with the Avignon popes sometimes working for them and sometimes trying to achieve the return of the papacy to Rome -- he was a political opportunist. 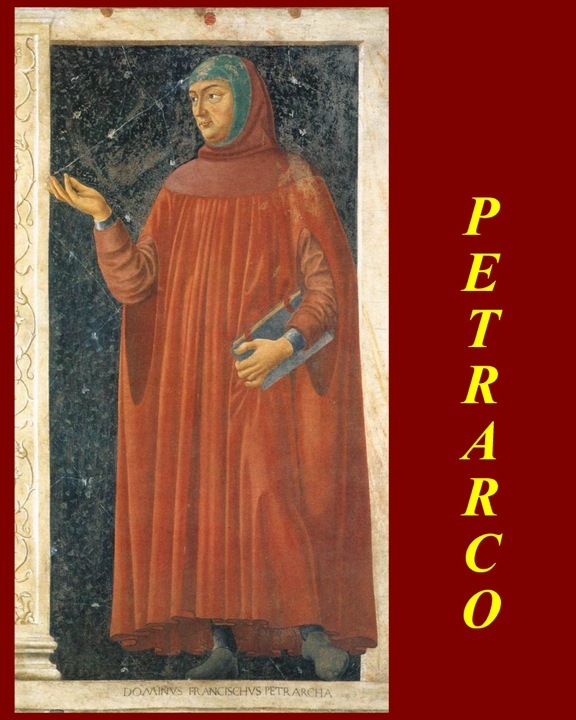 For more on Petrarch, see https://en.wikipedia.org/wiki/Petrarch, and http://petrarch.petersadlon.com/petrarch.html. For more on the troubadour poets, see http://en.wikipedia.org/wiki/Troubadour and http://www.midi-france.info/1904_troubadours.htm. 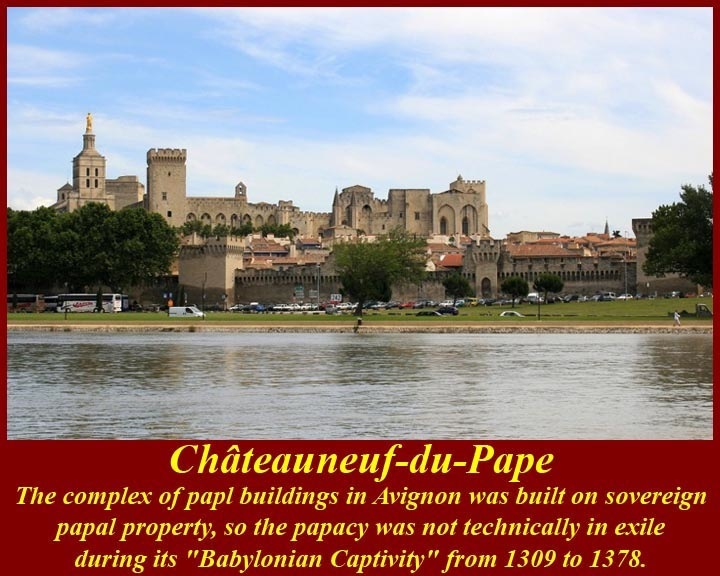 The Avignon Papacy refers to a period in the history of the Roman Catholic Church from 1309 to 1378 when the seat of the Pope was moved from Rome to Avignon. The period has been called the "Babylonian Captivity" (or "Babylonish Captivity") of the Popes (or the Church), particularly by Martin Luther. This nick-name is polemical, in that it refers to the claim by critics that the fabulous prosperity of the church at this time was accompanied by a profound compromise of the Papacy's spiritual integrity, especially in the alleged subordination of the powers of the Church to the ambitions of the Frankish emperor. Coincidentally, the "captivity" of the popes at Avignon lasted around the same duration as the exile of the Jews in Babylon, making the analogy all the more convenient and rhetorically potent. In 1378 the seat was moved back to Rome, while a disputing party continued to honor the bishop in Avignon as the head of the church. From 1378 to 1414 was a time of difficulty which Catholic scholars refer to as the "Papal Schism" or, "the great controversy of the antipopes" (also called the Second Great Schism by some secular and Protestant historians), when parties within the Catholic Church were divided in their allegiances among the various claimants to the office of Pope. 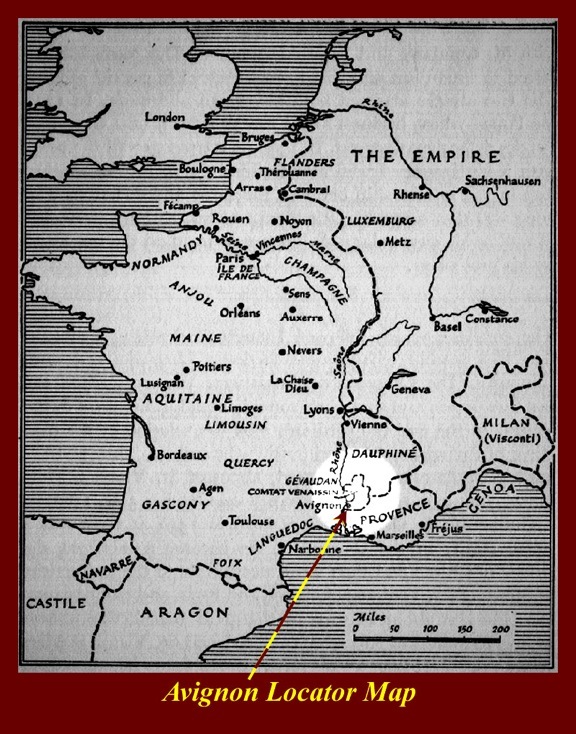 The Council of Constance, which convened in 1414, finally resolved the controversy, dismantling the last vestiges of the Avignon Papacy and brought the Great Schism to an end in 1417. 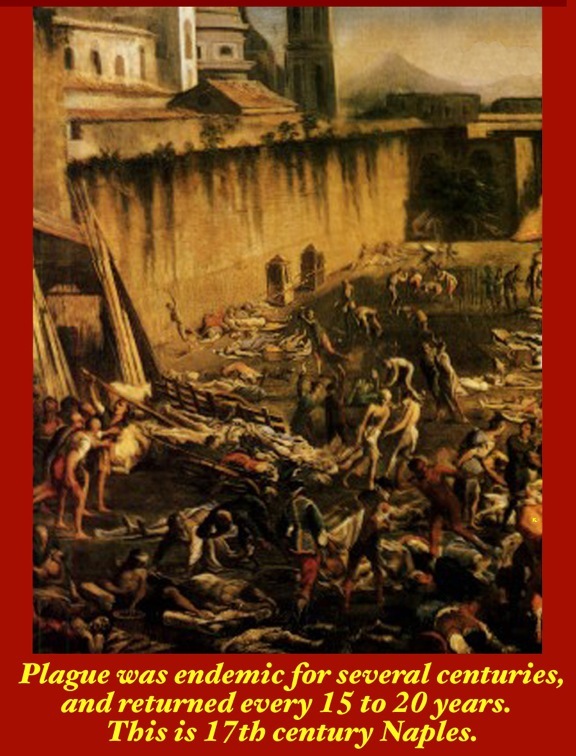 For more on the Avignon Papacy, see http://www.newadvent.org/cathen/02158a.htm. The Filippo Rusuti (ca. 1297-1317) Mosaics are now hidden on the back wall of the Baroque Logia of Santa Maria Maggiore in Rome but they were originally fully visible on the front façade of the building. Mosaics, it should be noted, were the higher class form of art of the medieval as well as ancient Roman periods; frescoes, although longer lasting because they were more durable, were considered to be inferior substitutes for more expensive mosaic art. 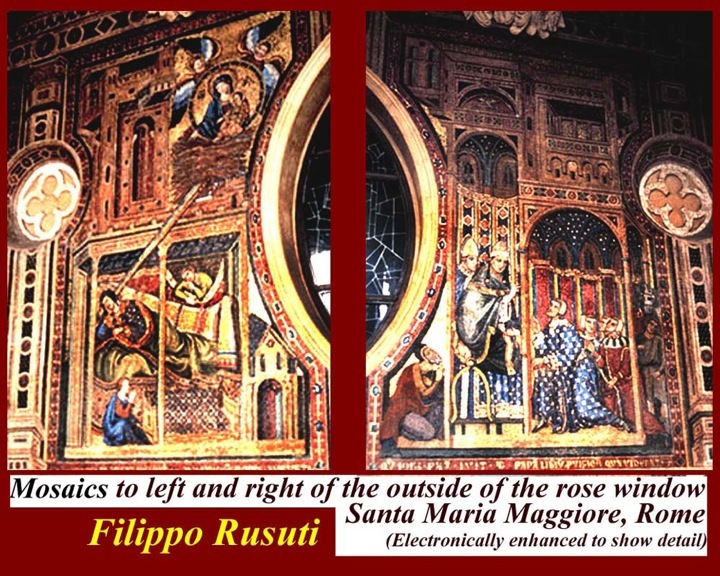 Rusuti's only certain work is the mosaic on the façade of S Maria Maggiore, Rome, which is signed. 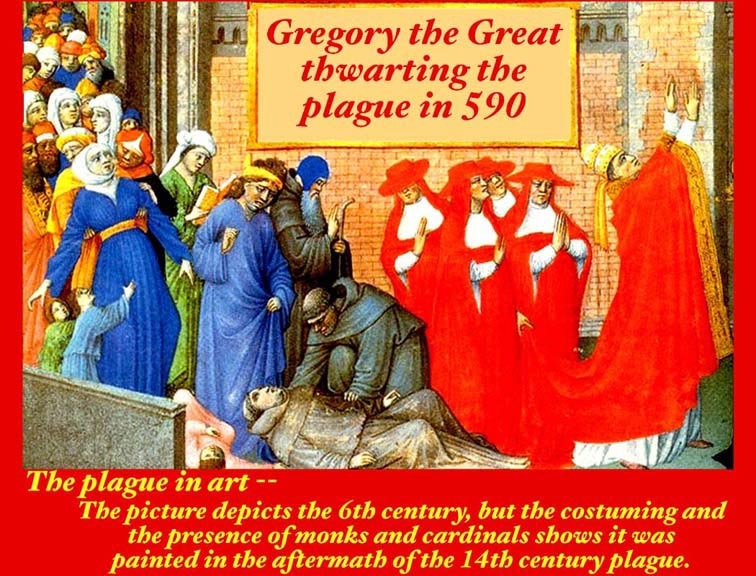 He served as 'King's painter' in France during the reigns of Philip IV and Louis IX, receiving payments in 1304/5, 1308 (for repairs in the Grande Salle of the royal palace at Poitiers), 1309, 1316 and 1317, but none of this work survives. His use of perspective is notable, and he, like Pietro Cavallini, preceded Goitto. Cimabue: Cenni di Pepo (Giovanni) Cimabue (ca. 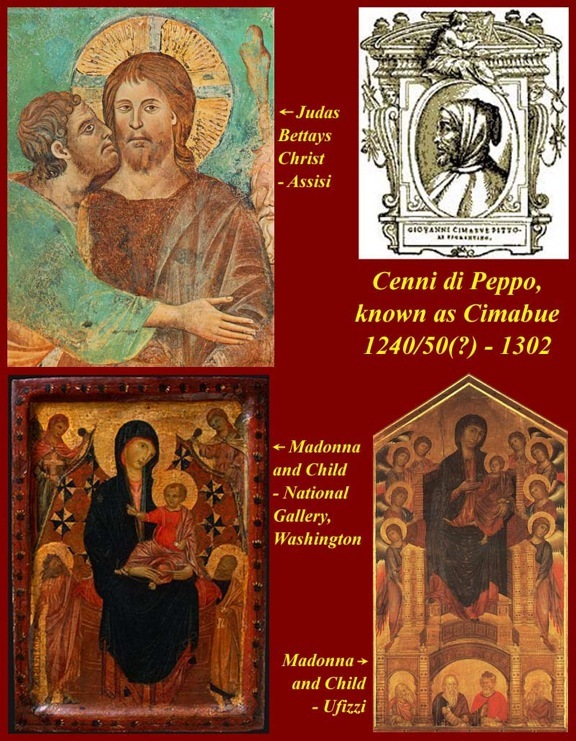 1240 — c. 1302) also known as Bencivieni di Pepo or in modern Italian, Benvenuto di Giuseppe, was an Italian painter and creator of mosaics from Florence. 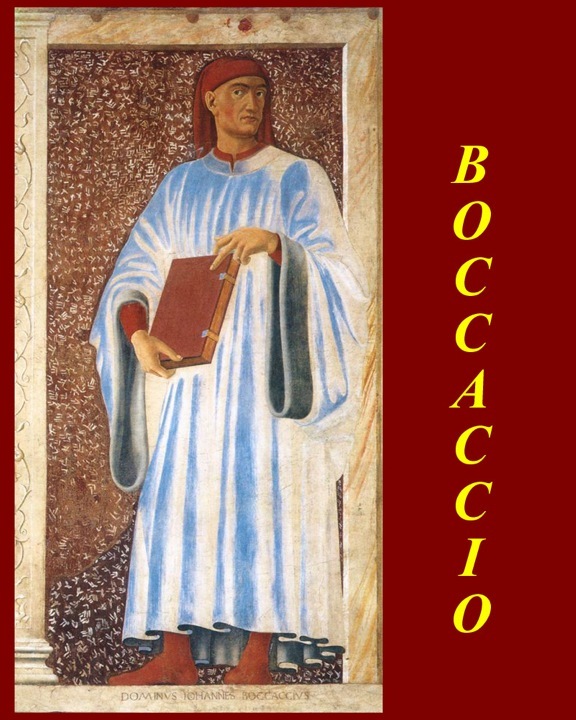 He is also well known for his student Giotto, considered the first great artist of the Italian Renaissance. Cimabue is generally regarded as the last great Italian painter working in the Byzantine tradition. The art of this period comprised scenes and forms that appeared relatively flat and highly stylized. Cimabue was a pioneer in the move towards naturalism, as his figures were depicted with rather more life-like proportions and shading. 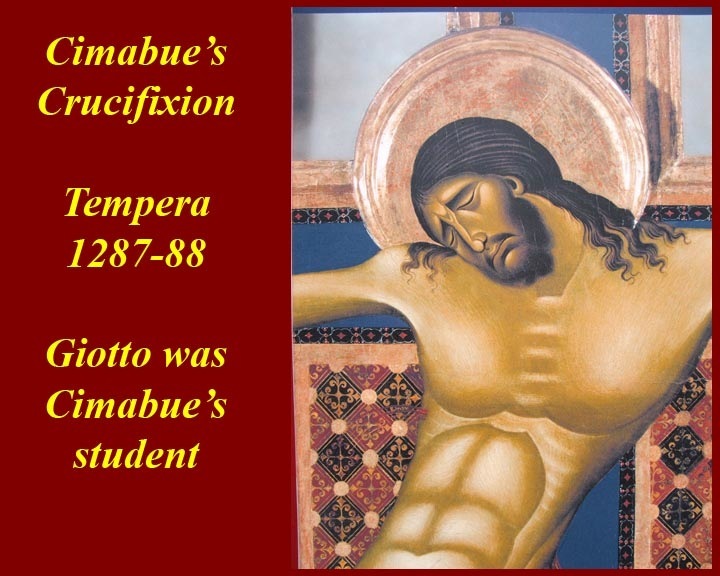 His 448 × 390 cm Crucifixion of Christ, tempera on wood painted in 1287-88 in chiesa di San Domenico in Arezzo, Italy, is especially striking; the face of Christ could have been done by Picasso. For more images of Cimabue's Crucifixion, including one of the face before the work's recent cleaning restoration, see http://commons.wikimedia.org/wiki/Category:Crucifix_by_Cimabue_(Arezzo). 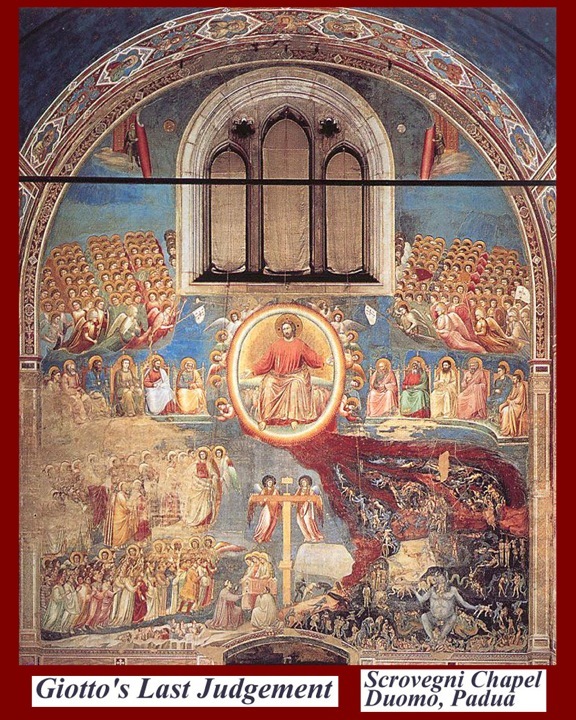 Giotto's Last Judgment and the Scravegni Chapel fresco cycle, Scravegni Chapel in the Padua Duomo and Cavallini's earlier works in Santa Maria in Trastevere church in Rome. Giotto also worked in Santa Maria in Trastevere church in Rome where he would have seen works already installed by Pietro Cavallini. 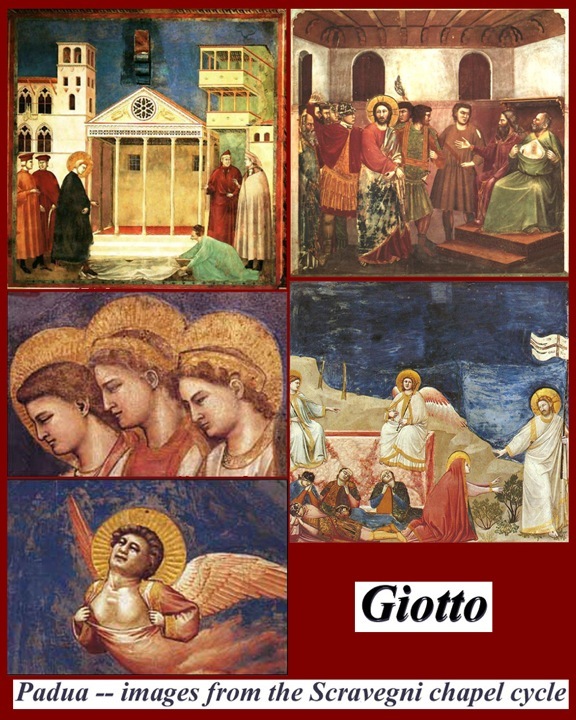 For more information on Giotto di Bondone and on the question of whether some of the works ascribed to him in Assisi were actually done by Pietro Cavalinni, see http://www.mmdtkw.org/VGiotto.html. 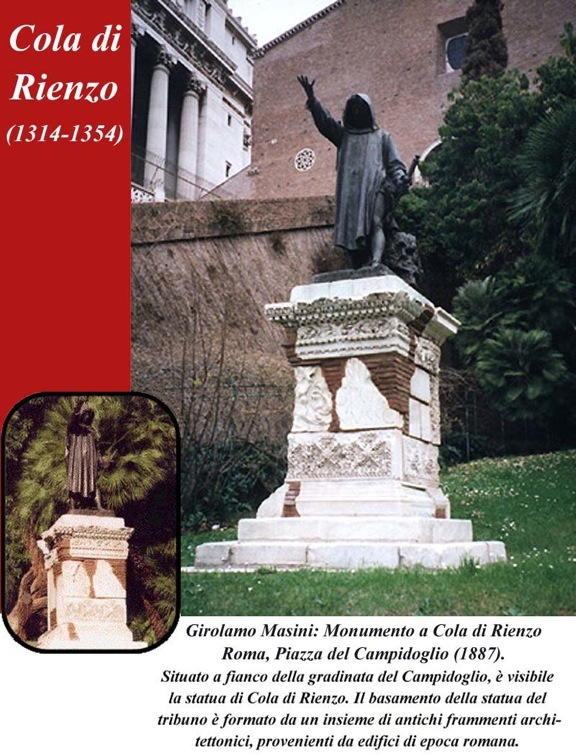 Cola di Rienzo (1314 - 1354) was a man of the Trastevere lower classes with a fixation on ancient Rome. 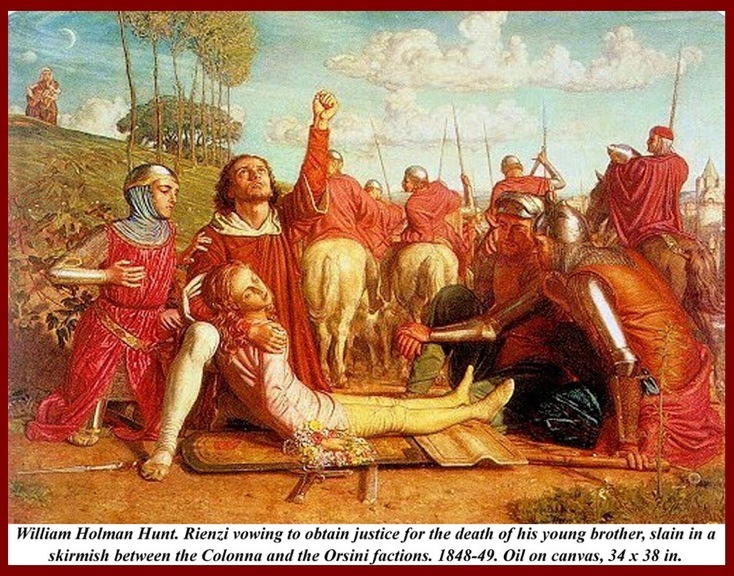 According to his and Petrarch's propaganda, Rienzi's younger brother was an innocent bystander who was slain in a skirmish between Colonna and Orsini thugs in Rome. He then declared war on all of Rome's nobility. He was probably manipulated by agents of the Avignon popes including, most importantly, Petrarch. For much more on Rienzi, see http://www.mmdtkw.org/VRienzi.html. 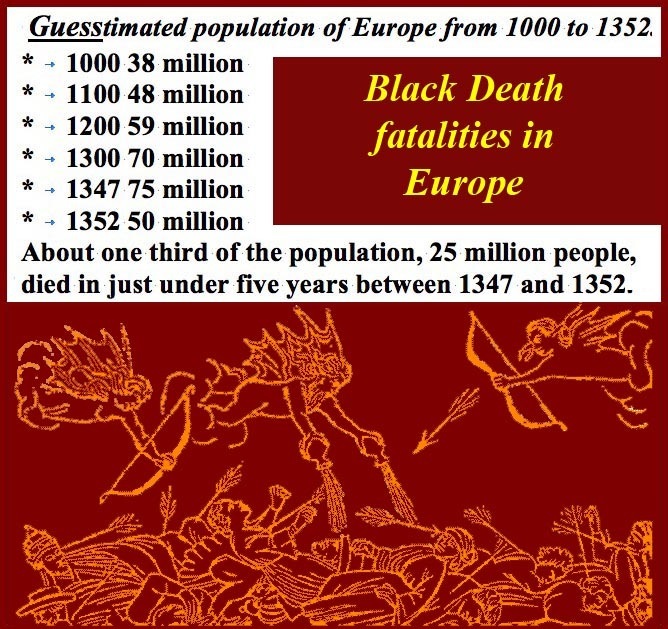 For much more information on the plague, see http://en.wikipedia.org/wiki/Black_Death. In the late medieval period a dispute (called the "investiture controversy" by modern historians) arose when the popes insisted that they had the right to choose and invest bishops and abbots. In earlier times, such profitable offices were the gift of local kings and lords, and, of course, were filled by their favorites rather than those of the popes. A lot of money was involved both in the sale of the offices and in the exercise of the offices. The Hohenstaufen family family were supplying the incumbent Holy Roman Emperors, and they would be the most injured if the popes got to name bishops and abbots. The Hohenstaufen had their headquarters in a Waiblingen castle (in southwest Germany in the center of the Stuttgart region). 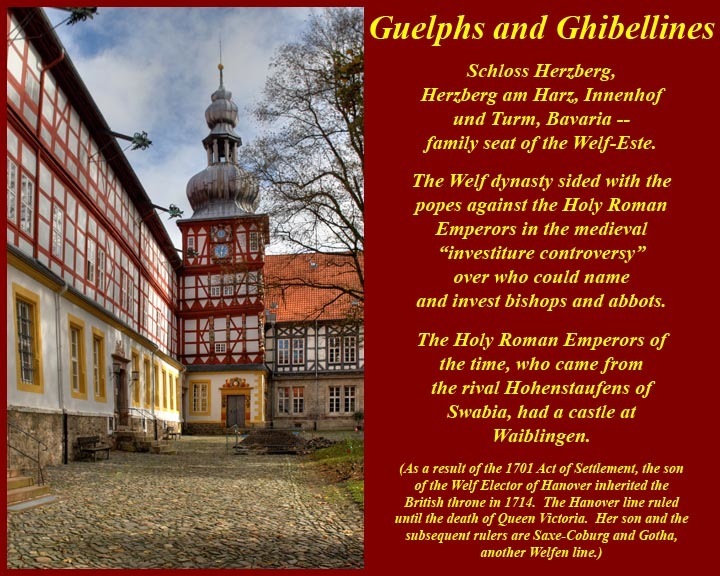 The Welf families were the other major force in the Holy Roman Empire -- themselves having ambitions to take over the imperial throne -- and they hoped to diminish the power of the Hohenstaufens by supporting the Popes in the investiture controversy. The Welf had their seat in Herzberg am Harz, Bavaria, in central Germany. A number of major battles were fought between the Hohenstaufen and the Welf, during which the opposing sides used "Welf" and "Waiblingen" as their battle cries. Those two battle cries became Guelph and Ghibelline when families allied to the two German families imported the dispute into northern Italy. 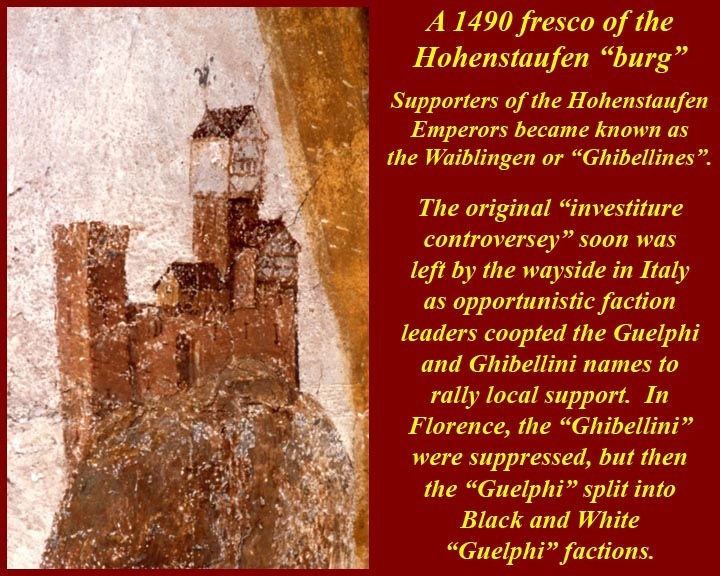 In fact, by the end of the medieval period, the investiture controversy had ceased to be central to the fighting between Guelph and Ghibelline factions in Italy -- "Guelphs" and "Ghibellines" were merely the names of fluid groupings of families struggling for local power. In Florence, the Ghibelline factions were defeated and killed or driven out. No matter. The Guelphs quickly split into "Black" and "White" Guelphs and the struggles for dominance continued. We started with the preexisting European trade routes, but interest in trade with the East was one of the main drivers of the Renaissance and particularly with the Renaissance as expressed around the Mediterranean. The travels Marco Polo (ca. 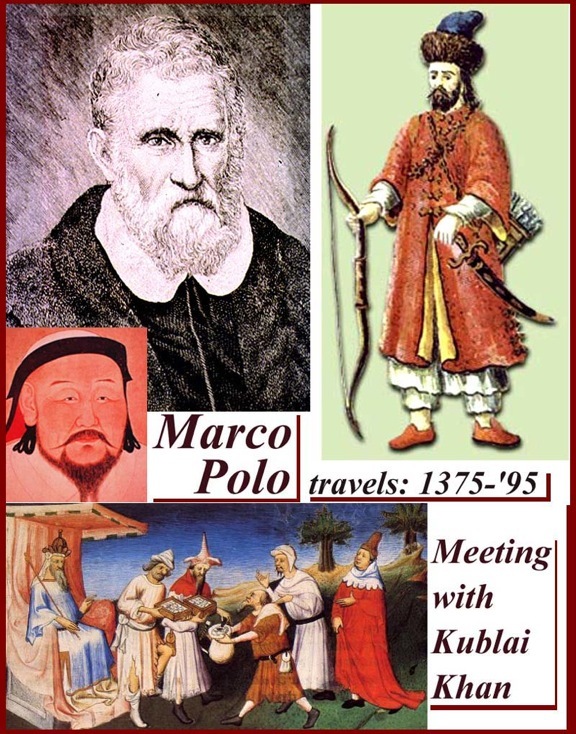 1254 – January 8, 1324) and his best selling travel book, called, not very imaginatively, The Travels of Marco Polo, were what captured everyone's imagination. For a short bio of Polo, see http://en.wikipedia.org/wiki/Marco_Polo and for a description of his book, see http://en.wikipedia.org/wiki/The_Travels_of_Marco_Polo. 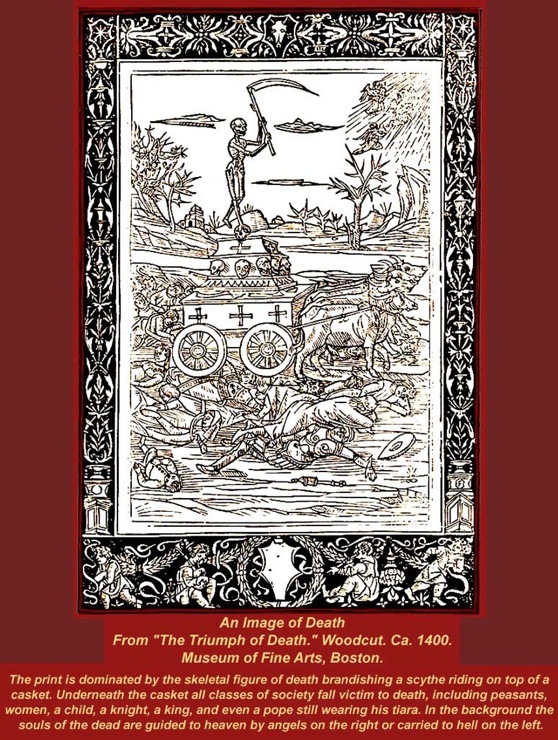 Volume I of the book is available free on line at http://www.gutenberg.org/etext/10636, and Volume II is at http://www.gutenberg.org/etext/12410.